The internal audit unit reports directly to the Board of Directors. 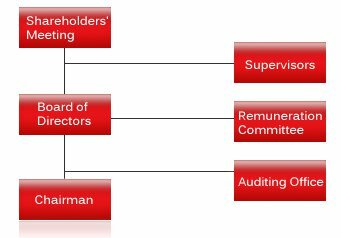 Member of internal audit unit include 1 auditing supervisor and 1 auditor shall be approved by the Board of Directors on needed basis. The internal audit is executed in accordance with internal auditing schedule which is established upon risk evaluation through Board of Directors. The internal audit unit needs to submit auditing reports of shortcomings and improvement recommendations to Board of Directors. The internal audit supervises each departments and subsidiaries to process annual self-inspections on internal control system to ensure the effectiveness. Then Internal audit examines and consolidates related inspection reports for the President and Board of Directors to evaluate the overall efficiency of existing internal control systems before generating the Internal Control System Statements.